After you have installed Printer Installer use this guide for a quick overview of using the product. Login to the Administrator (http://WebserverNameOrURL/admin) and follow these steps. 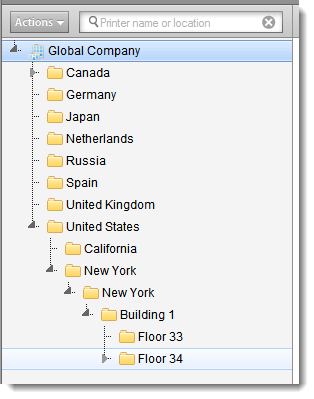 Start by creating folder objects that represent your company's geographic locations. 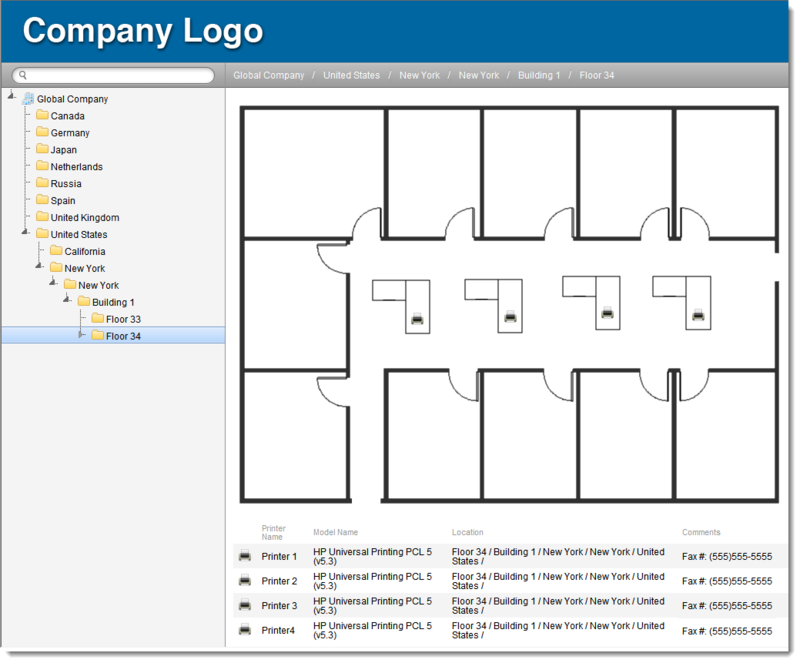 To create folder objects, right click the company object, or click on the Actions button, and select New > Folder. 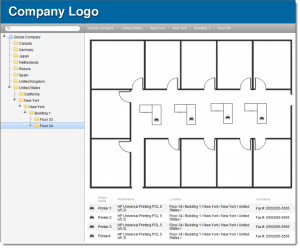 The tree structure is also shown in the Printer Install Portal (http://WebserverNameOrURL/) and enables users to quickly find the printers they want to install. 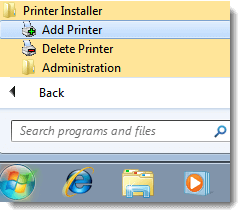 To create a printer, right click the folder object you want the printer created in (or click the Action button) and select New, and then TCP/IP Printer or Windows Shared Printers. You can create two different types of printers; TCP/IP and Windows shared. TCP/IP: Create direct IP printers if you want your end users to print directly to the printer without a print server. Direct IP printers can be imported from Novell print systems or Microsoft print servers. Shared Printers: Create shared printers if you want end users to install or be provisioned printers that print to Windows shared printers on a print server. Windows shared printers can be read from print servers and kept in sync automatically. Use the built in Microsoft Printer Import or Novell Printer Import applications to import existing Microsoft or Novell printers. See Importing Novell or Importing Microsoft Printers for more information. 1. Right click the folder object you want the printer created in (or click the Action button) and select Add, and then TCP/IP Printer. The Create TCP/IP Printer dialog will open. 2. Enter a name in the Printer Name field. 3. Enter the IP address of the printer. 4. Select a driver for each supported operating system. 4.1 Click the Upload New Driver button above the operating system’s available drivers drop down list. The “Add Driver” dialog box will open. If the local computer does not already have the appropriate printer drivers in its driver store, download and extract the appropriate driver files, and then in the “Add Driver” dialog box, click the Browse button and browse to the location of the driver files. 4.2 Select the driver manufacturer and model that you want to upload into the Printer Driver Repository, then click Next. Notice the “Annotation String” input box at the bottom of the screen. The program will add a default annotation string that describes the type of operating system it expects the driver to support. If you are uploading a driver that already exists in the Printer Driver Repository with the same model name, you can change this value to allow both drivers to exist in the Printer Driver Repository. 4.3 Check the drivers supported g determines what operating system's driver lists the driver is included in. 4.4 Click Upload. The newly uploaded driver will be selected for the currently selected operating system. Upload additional drivers for each client computer operating system that will be installing this printer. Note: Uploaded drivers are added to the driver repository. See Managing the driver repository for more information about the driver repository. 5. Click Add. The printer object will be listed in the tree. Windows shared printer objects are imported from a Windows print server and automatically kept in sync. See Managing Windows Shared Printers for more information. There are three methods to install printers on end user computers. End users visit the Printer Install Portal and click on the printer they want to install. Click Start, All Programs, Printer Installer, Add Printer. The Printer Install Portal will open in the default browser. Click the Printer Installer system tray icon and select Add Printer. The Printer Install Portal will open in the default browser. After opening the Portal use one of the below options to find a printer object in the tree and then click on the printer to install it. Browse the folders in the tree to find a printer object in the tree and then click on the printer to install it. When end users log on and the computer has an IP address in a specified range, the printer will be automatically installed. If your office locations are setup with separate subnets, deploying printers by IP address range can be a very simple way to deploy printers to end users without any need for Active Directory groups. Simply create an IP Address Range object and add it to the deploy tab of a printer and the printer will be installed to all users that have IP addresses in the specifed range. 1. 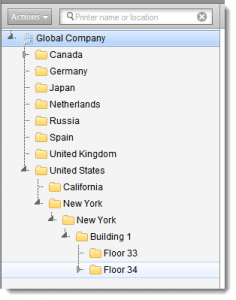 Select a folder in the tree that you want to create the IP Address range in. Usually, it is best to create the IP Address Range object in the folder that represents the physical network of the IP address range. 2. 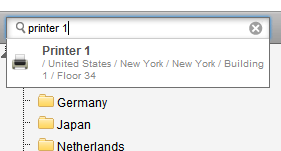 Right click and select New, and then select IP Address Range. 3. Enter a name for the IP Address Range. Add the IP Address Range to the Deploy tab of a printer. 1. 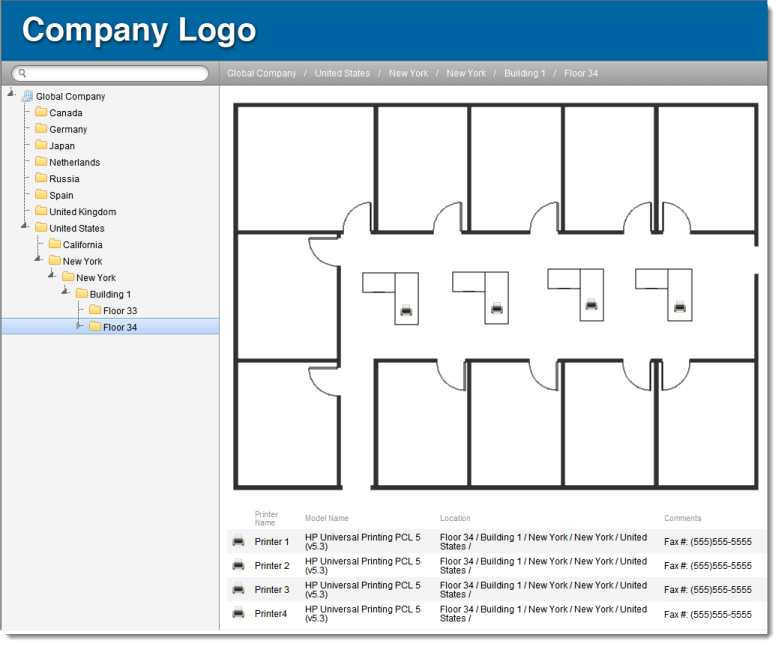 Select a printer object and then select the Deploy tab. 3. Browse to an IP Address Range object,click Add. The IP Address Range will be added to the deploy list. The next time a user logs in with an IP address in the specified range, the printer will be automatically installed. When end users logon and the computer or user is a member of a specified AD group, user or computer object, the printer will automatically be installed. Add the AD object to the Deploy tab of a printer. 2. Click the Add button, and then select Active Directory, and then User, Computer, or Group. 3. Type in the name of the object and click OK. The object will be added to the deploy list. The next time a user that is a member of the object logs in, the printer will be installed. Note: All printer installation methods require the Printer Installer Client (PIC).